These wondrous miniatures, mind-boggling to behold, are displayed in a re-creation of Hurley’s Cottage, home of Amy Cohn’s Tahoe City curio shop, courtesy of collection owner Gene Quintana. Born in 1835, her given name was “Dabuda”, meaning “Young Willow” which proved to be very prophetic. She used the willow in her basket weaving which made her famous. It is estimated that she created over 300 baskets in her lifetime, and many of these were at Lake Tahoe. While Washoe women would weave many baskets to cook and store food, winnow seeds and carry infants as part of their culture, Dat So La Lee’s baskets gained notoriety as coveted pieces of art. Her baskets were woven with tiny stitches that were pulled tightly into a coil made of willow twigs. Her geometrical designs were small and repetitive, and included lines or triangles. Dat So La Lee married a Washoe man named Assu, and had two children, neither of whom lived to adulthood. She later married Charley Keyser in 1888, and took the name Louisa Keyser. However, in the late 1860s, she formed a friendship with a Dr. S. L. Lee of Carson City, where she earned the nickname Dat So La Lee and this name stayed with her the remainder of her life. 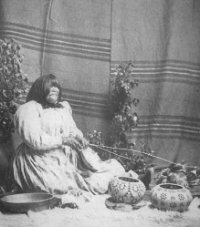 Dat So La Lee learned traditional basket making during a time when the Washoe women were forced to weave in secret. To help her people, she moved to Carson City in 1895, offering small baskets for sale to Abe and Amy Cohn, the owners of an emporium. From that time until her death in 1925, Abe and Amy Cohn supported Dat So La Lee so she could concentrate on making her superb baskets. 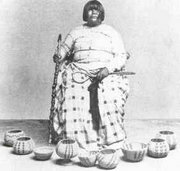 She often joined the Cohns at their store in Tahoe City, where she sold her baskets to tourists and collectors. Dat So La Lee is well known for three types of baskets: the singam (a square ended or blunt cone shape), a mokeewit (cone shaped burden basket), and her best known design, the degikup (day-gee-coop) where the basket begins with a small, circular base, extends up and out to a maximum circumference, and then becomes smaller until the opening at the top is roughly the same diameter at the base. Although she grew blind in her later years, she continued to experiment with design and color. She died in 1925 at the age of 90 and is buried in the Stewart Indian cemetery in Carson City. Just five years after her death, one of her baskets sold for $10,000 and still others have netted as much as $250,000. You will be overwhelmed by the collection of fine basketry created by our earliest Tahoe inhabitants located at the Gatekeeper’s Museum. 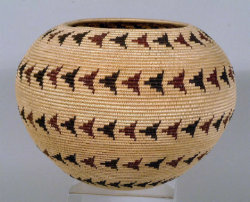 The Museum Store sells fine basketry separate from the collection. Museum admission is free to NLTHS members (memberships start at $30, with student memberships available for $5); $5 general admission; $4 seniors; children under 12 free with a paying adult. It is a Blue Star museum, so active military personnel and their families are free.